Cured-in-Place-Pipe Lining repair is a practical, fast and economical no-dig solution for pipes with partial structural deterioration and/or distortion, interior corrosion, settling, misalignment and cracking. It provides jointless renovation, improves flow characteristics, adds to the structural integrity of the pipe and virtually eliminates all exfiltration and infiltration at the repaired area. 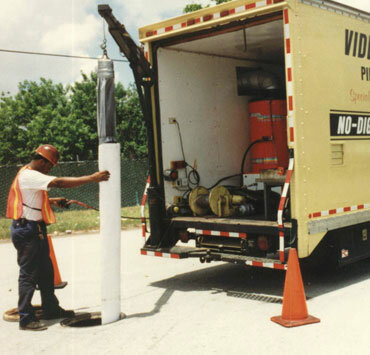 Our Cured-in-Place-Pipe lining consists of an epoxy-based, impregnated polyurethane-coated felt tubing that is installed by experienced technicians using trenchless “pull in, inflate and cure” methods. It is used for sectional pipe repairs and can reconstruct pipe segments from 6 inches to 3 feet in diameter, and 1 to 30 feet in length. Our methods exceed all ASTM minimum strength requirements, and the epoxies can be formulated for job specific applications.